1960 NSU Prinz - This is pretty interesting, both as a car and its history. The 1960 Prinz had a 583cc, 2 cylinder (4 stroke), 30 HP engine. That doesn't seem like much until you realize this car weighed around 1100 lbs. That 30 HP was able to propel this car to 75 MPH. In 1961, the Prinz was replaced by what was commonly called the Prinz 4, a car that looked an awful lot like the Chevy Corvair. The NSU being offered on eBay has a claimed 28,000 miles on it and has been in storage since 1971. It needs restoration, but is in remarkably good condition. According to the seller of the car, a NSU Prinz won the Little Le Mans race at Lime Rock Park in 1959. That appears to be true, although it seems that there were different classes and I can't find what cars it was competing against. The 1964 NSU (Prinz) Spider featured the first publicly available Wankel rotary engine. In 1969, the company was taken over by Volkswagen Group, who merged NSU with Auto Union to form what we know today as Audi. The TT name, now being used by Audi for their sports coupe and convertible, was first used by NSU in the late sixties to designate the sports version of the Prinz. The NSU factory in Neckarsulm, Germany, where this Prinz was built, is now the production plant for Audi A6, A8 and R8 cars. 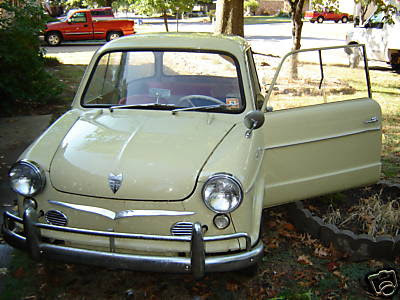 Click here to see the eBay listing for this 1960 NSU Prinz. For more info about the NSU Prinz, check out NSUPrinz.com. 1973 BMW Baur Cabriolet - It's become my mantra lately... Bigger driveway, bigger bank account balance... Bigger driveway, bigger bank account balance... If I had both, this car would be mine. The 2002 Targa, like this one, and the E30 convertible (which also kept a portion of its roof structure) are probably what Baur is most famous for, but Baur has created or built other convertibles for BMW, including the E36 4 door convertible. Baur has also designed body kits and has worked with Opel, Mercedes, Porsche (building the 959 for them), Audi (at one time producing all the components for the Audi Quattro suspension) and Ford. The car being offered on eBay was imported to the US in 2004. It was completely restored in Germany and appears to need very little. Honestly, I don't think the Targa conversion (especially with the rear folded)looks all that good. If I were buying a 2002 based strictly on looks I'd go for a regular old hardtop or, if I could find one in the US, a hatchback Touring. However, open air motoring with a 2002 engine and suspension just seems so good that I'm certain I'd get used to the Targa's looks. 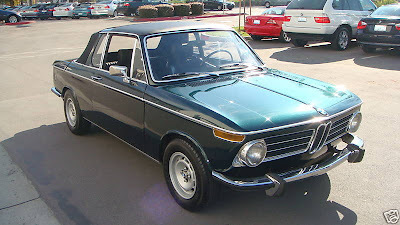 Click here to see the listing for this 1973 Baur BMW 2002.